The international currency markets are massive and liquid. Stories abound of traders destroyed or made by gutsy calls. Fortunes are made on small moves of highly leveraged positions. While FX traders make their livings looking for macro trends and micro arbitrage opportunities, international business people generally respond to business requirements. Large companies may hedge some long term (6 - 12 months of anticipated requirements) to minimize revenue and profit disruptions. And even small companies can easily hedge specific contractual obligations with swaps and simple contracts. 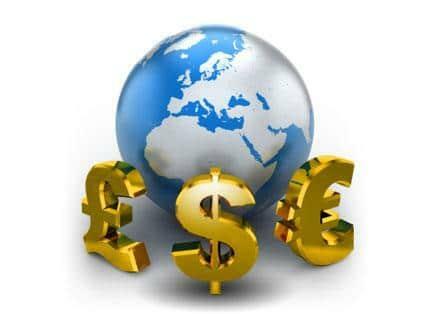 But the general trend can have an important impact on business - or conversely, the fact that currencies tend to move in cycles offers business a remarkable opportunity to diversify into counter-cyclical markets (geographical, investment trend, growth vs. contraction) and leverage currency in the process. This requires 3D thinking, and demands that business people step outside of the comfortable paradigms of USD denominated contracts and receivables, embracing the opportunity presented rather than allowing lack of familiarity to discourage growth. But what are the general trends? Any trade requires two sides - so it shouldn't be surprising that there are two radically different perspectives on the dollar's macro trends. Putting aside linking and other central banking manipulations (which in the end are almost invariably trumped by the size, fluidity and forces of FX markets) generally currencies reflect the inherent perceived strengths and weaknesses in the structure of the issuing country. As currencies no longer represent a specific amount of gold or silver, but rather rely on government promises (fiat currencies) the foundation is the discriminator. An interesting article arguing this point was recently published in the Wall Street Journal (2 March, 2011) entitled Why the Dollar's Reign is Near an End. But this is a VERY CROWDED trade. It is worth noting that Angela Merkel, German Chancellor, has come our several times recently to proclaim the EUR solid and the EU strong. One might consider the implications of her feeling she must do so, and remember that Germany, the economic hub of both the alliance and the currency, has a population which in polls indicates it is more than 50% in favor of returning to the Deutsch Mark! How does a company plan? The beauty of the alternatives is that they both represent opportunities for creative American enterprises. Business can benefit in either case. But to realize those takes time, investment, foresight and creative, capable experienced global management. Clearly, the change will make life more complicated for U.S. companies. Until now they have had the convenience of using the same currency—dollars—whether they are paying their workers, importing parts and components, or selling their products to foreign customers. They don't have to incur the cost of changing foreign-currency earnings into dollars. They don't have to purchase forward contracts and options to protect against financial losses due to changes in the exchange rate. This will all change in the brave new world that is coming. American companies will have to cope with some of the same exchange-rate risks and exposures as their foreign competitors. A comprehensive strategic plan for both revenue growth and cost arbitrage, combined with clear decision triggers and regular review and testing, provides the road map to unlock the opportunity created through currency variation.